Cal-Mil 3014-55 Luxe Three Compartment Condiment Organizer with Stainless Steel Base - 9 1/4" x 4 1/2" x 2 1/2"
This Cal-Mil 3014-55 Luxe three compartment condiment organizer is a versatile display piece for your establishment! 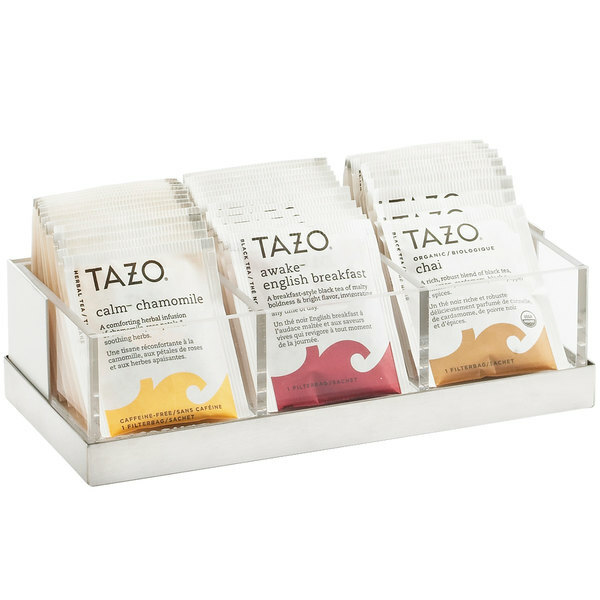 The separate compartments allow you to store various condiment packets, and they're even wide enough to store tea bags, creating an upscale display at your cafe, coffee shop, or buffet's self-service station. This unit's design is stylish enough to accompany any decor! Complete with clear acrylic dividers, it provides perfect product visibility! With a white metal back and a beautiful stainless steel base, this unit will maintain the elegant appeal of your establishment, and it's sure to be a hit with your customers! This product can expose you to chemicals including Ethyl Acrylate, which are known to the State of California to cause cancer, birth defects, or other reproductive harm. For more information, go to www.p65warnings.ca.gov. WARNING: This product can expose you to chemicals including Ethyl Acrylate, which are known to the State of California to cause cancer, birth defects, or other reproductive harm. For more information, go to www.p65warnings.ca.gov. Cal-Mil 3011-55 Luxe White Metal Chafer Griddle with Stainless Steel Base - 12" x 12" x 8 1/4"
Cal-Mil 3005-10-55 Luxe White Ice Housing with Stainless Steel Trim and Clear Pan - 12 1/4" x 10" x 6 1/2"
Cal-Mil 3015-55 Luxe White Metal Three Compartment Flatware Organizer with Stainless Steel Base and Acrylic Dividers - 8 1/4" x 5 3/4" x 6"
Cal-Mil 3004-55 Luxe Two Step White Melamine Ice Housing with Stainless Steel Trim - 12 3/4" x 7" x 8"
Cal-Mil 3010-55 Luxe White Metal Vertical Cylinder Flatware Display with Stainless Steel Base - 6 3/4" x 7 1/2" x 20 1/4"
Cal-Mil 3001-55 Luxe Revolving Cup and Lid Organizer with Stainless Steel Base - 8 1/4" x 8 1/4" x 19"
Cal-Mil 3012-55 Luxe White Metal Chafer Griddle with Stainless Steel Base - 12" x 22" x 8 1/2"
Cal-Mil 3002-3INF-55 Luxe 3 Gallon Stainless Steel Beverage Dispenser with Infusion Chamber - 7 3/4" x 7 3/4" x 25 3/4"
Cal-Mil 3008-55 Luxe White Metal 2 Step Airpot Stand with Drip Trays and Stainless Steel Base - 7" x 22 1/2" x 12 1/2"
Cal-Mil 3013-55 Luxe Multi-Bin Condiment and Stir Stick Organizer with Stainless Steel Base - 8 1/4" x 6" x 5"
Cal-Mil 3009-55 Luxe Multi-Bin Condiment and Stir Stick Organizer with Stainless Steel Base - 12 1/4" x 12 1/4" x 6 1/2"
Cal-Mil 3003-55-12 Luxe Three Tier 4" Glass Jar Display with White Metal Frame and Stainless Steel Accent - 4 1/2" x 12 1/4" x 9"
Cal-Mil 3003-55-15 Luxe Three Tier 4" Melamine Jar Display with White Metal Frame and Stainless Steel Accent - 4 1/2" x 12 1/4" x 9"
Cal-Mil 3002-3-55 Luxe 3 Gallon Stainless Steel Beverage Dispenser with Ice Chamber - 7 3/4" x 7 3/4" x 25 3/4"
Cal-Mil 3005-12-55 Luxe White Metal Ice and Beverage Housing Display with Stainless Steel Base and Clear Polycarbonate Bin - 12 1/4" x 20 1/4" x 6 1/4"
Cal-Mil 3024-55 Luxe Four Bowl Stainless Steel Multi Level Display - 20" x 16" x 13 1/2"
Cal-Mil 3026-55 Luxe White Rectangular Riser with Stainless Steel Base - 12" x 10" x 6 1/2"
Cal-Mil 3020-55 Luxe Three Tier Stainless Steel Bakery Display Case - 19" x 20" x 19"
Cal-Mil 3018-55-15 Luxe Condiment Display with Melamine Jars and Stainless Steel Base - 12 1/4" x 9" x 15 1/2"
Cal-Mil 3018-55-12 Luxe Condiment Display with Glass Jars and Stainless Steel Base - 12 1/4" x 9" x 15 1/2"
Cal-Mil 3021-55 Luxe Three Tier Stainless Steel Bread Case - 7" x 14" x 20 1/4"
Cal-Mil 3022-55 Luxe 3 Bowl Stainless Steel Display - 10" x 16 1/4" x 17"
Cal-Mil 3025-55 Luxe White Rectangular Riser with Stainless Steel Base - 12" x 20" x 6 1/2"
Cal-Mil 3598-3-55 Luxe 13.5 Liter Silver Triple Canister Cereal Dispenser - 20 1/2" x 7 1/4" x 27"
Cal-Mil 3927-55 Luxe Single Bin Bread Drawer - 12 1/4" x 6 3/4" x 6 3/4"
Cal-Mil 3448-55 Luxe 2-Tier Offset Merchandiser - 20 3/4" x 15 1/2" x 12 3/4"
Overall User Rating: Cal-Mil 3014-55 Luxe Three Compartment Condiment Organizer with Stainless Steel Base - 9 1/4" x 4 1/2" x 2 1/2"
The Cal-Mil Luxe Threw Compartment condiment organizer with Stainless Steel base is sturdy and well made. 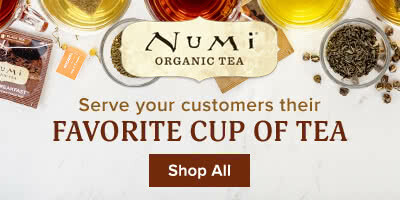 It is a great way to display your condiments or Tea Bags. This organizer looks great and feels great. For what you actually get though this seems very expensive. I think there are cheaper options out there that could get you the same organization. The quality of this is great though.